There should be a forum for listing all suspensions and bannings, with an explanation for each. The "must assume mind /= brain" quasi-rule should be eliminated. Instead, if a thread is marked Mod+, then the person starting the thread should explain the rules in the opening post. -There should be a process (maybe informal PM "warnings", followed by Official in-thread Warnings) for all bannings outside of spammers and overt, malicious trolls. The same process should stand for other "heavy-handed" mod actions (thread locking, post deletions, etc). -"Us vs Them" childish, tribalist thinking should not be encouraged, if not actively discouraged, by forum staff. I'd like to hear a good interview with the author of Tryptamine Palace, James Oroc. He claims something akin to union is possible with 5meo-dmt . . . 5meo is incredibly stronger than normal DMT, which is what adds to an already interesting subject. What needs fixing? What needs improving? I "need" my skins. Adding skin means that this original white is still there but there is options for individual skins that doesn't affect anyone else. And I want some smileys. Otherwise I´m a happy camper. 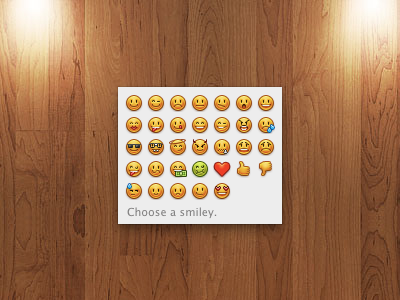 post of link of smileys you like. I liked the first set though, as they are pretty distinct. The last set isn't that bad either. It seem to have a wider set as well. But lets hear what other people have to say about it. Take the word spiritual off the heart icon. It degrades spirituality. It's mostly used humorously. Though it is funny, the heart is enough by itself. Lots of "500 internal server error" errors. Does the Mod+ tag meaning anything anymore? Alex, could we have a separate sub-forum just for posting resources, such as videos on a particular topic or links to papers? The NDE video thread tends to get lost in the "other" forum, so it would be nice to have a forum just for such threads. I'd like to start threads on particular researchers as well, just posting the links and videos that pertain to that individual, and making it clear that if people want to start discussions on this material, they should start a new thread in a different sub-forum. Having a Video and Resource Links sub-forum would make it easier to find material of interest. The current system of placing mod warnings on old posts is pointless. It pretty much guarantees the message won't be seen. Why not simply post a message in the thread, instead? I agree. Also send a PM. That should be "warning won't be seen." Below is a message I left recently on another part of this site. Mr. Ian Gordon was kind enough to refer me here. I have a question. Have you ever considered getting Neuroscientist Peter Tse as an interview guest on your program? Are you familiar with him? I think he would be an outstanding person to guest interview! He has a new theory of free will that is quite interesting. Let me throw you a few links since I don't recall his being discussed here before. Although I've been a longtime reader and enjoyer of this site, this is my very first posting. Can you give me some assistance? Is there a part of your site where people can recommend guests for future shows or interviews? I've tried to find this area but have been unsuccessful. I have a great idea for whom I think would be an excellent guest. Can you let me know how best to share this information with you? Thanks, and keep up the great work! Hi, Alex. I did send you an e-mail about this about a week ago. Did you receive it? I suggest interviewing John Horgan whose recent interview with Rupert Sheldrake I posted in Critical Discussions. He wrote "The End of Science." He certainly leans quite heavily towards materialism, though it's clear that he personally like Sheldrake and seemed far from dismissing his ideas. Mainly, I think a lot of what he says in his book is interesting and is coming from a direction that doesn't normally get talked about around here. Hey Reece, that's a good idea. I second it.